Feast Your Eyes on These Gorgeous Winter Parties! Hope this first week of 2019 has treated you well. 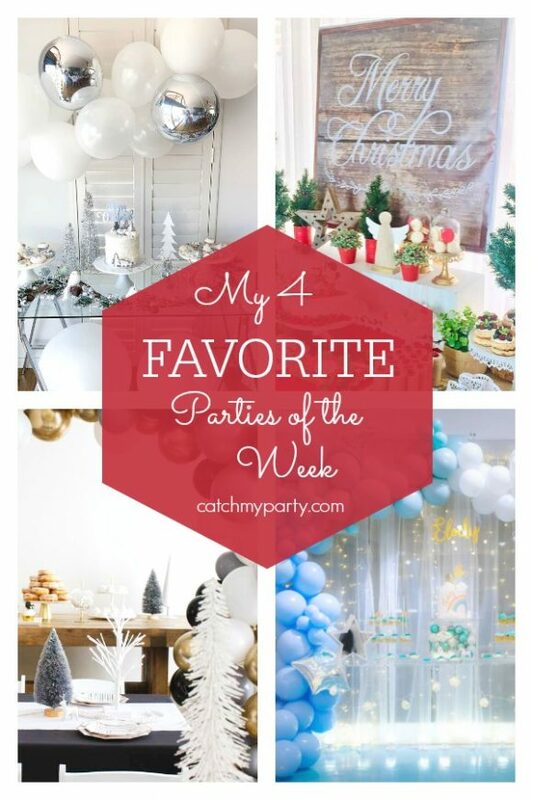 Loving all the gorgeous winter parties you've been sharing with us on at Catch My Party this past week! I Promise You'll Love This Ugly Sweater Holiday Party! Christmas is only a few weeks away, and we are starting to see some fun holiday parties that you guys are coming up with, including an awesome ugly sweater holiday party that I've picked out as one of my 4 favorites this week! You're in for a surprise with the Rice Krispie treats. 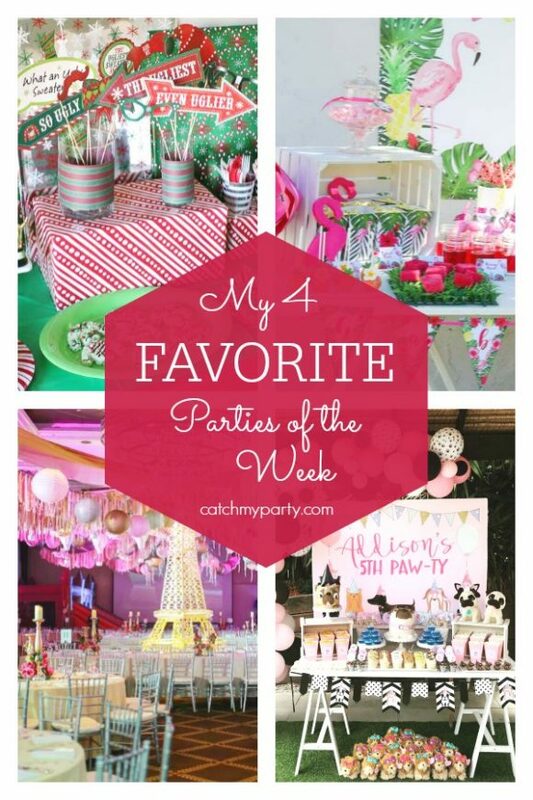 You'll also be blown away by the other parties that were added to Catch My Party this week. Girly Reindeer Holiday Party and More! The countdown to 2018 has began and most of our international followers are already there! Happy New Year everyone!! Let's finish off 2017 with my final 4 favorite parties of the week shared on CatchMyParty by you lovely people! Don't miss the adorable girly reindeer holiday party. It's just so pretty and such a treat to look at. You'll love it! My favorite parties this week include this gorgeous girly reindeer holiday party, a stunning Winter Wonderland Christmas party , a fabulous pink and gold Minnie soiree , and a stylish ultra violet NYE celebration. Rudolph The Red-Nosed Reindeer Christmas Party and More! Christmas is here, so I hope you are all having a wonderful time with your family and friends. Thank you, once again, to everyone who took time out of this very busy week to share their amazing parties with us at CatchMyParty! You guys are incredible! Pastel Christmas Party and More! Yay! Only 1 week left until Christmas (my favorite holiday of the year), so, if you're looking for some last minute inspiration don't miss the gorgeous Pastel Christmas Party that was added (along with many others) to CatchMyParty this week. You're going to be blown away! My favorite parties this week include this stunning pastel Christmas party, a modern geometric 18th birthday party , a fun tropical flamingo Christmas party, and an adorable Minnie Mouse 1st birthday party. I was asked by Butterfinger to showcase their new holiday candy, including their new Snowman Peanut Butter Cups. Since this is the year of the unicorn, I wanted to create an easy-to-make unicorn Christmas stocking DIY to show off the candy! How fun would this unicorn look on your mantle! And what could be better than stuffing it with all these holiday-themed, delicious candies. Here's a last minute wooden chalk Christmas ornament DIY that will give your tree that rustic boho look! And your kids can easily participate in this one. This is a great weekend activity for your family. Pancakes and Pajamas Christmas Party and More! The holidays are almost here and you guys continue to go out of your way to share your incredible parties with us at CatchMyParty! They are so inspirational and help so many people come up with ideas for their very own parties. Thank you! You're amazing! Don't miss the wonderful Pancakes and Pajamas Christmas party, that is certain to inspire you this holiday season! Unicorns are everywhere, so why not turn them into adorable Santa's for the holidays! I'm super excited to be sharing these FREE Unicorn Christmas Party Printables to help you decorate your Christmas parties this year! Aren't these the cutest?! The collection includes: invitations, a welcome sign, 2" cupcake toppers, a "Happy Holidays" banner, favor tags, tented cards, and water bottle labels!! Here's a super fun way to welcome Santa into your home this Christmas. Have your kids make their own cookie plates using this Santa cookie plate DIY! These are so simple to a make and will get your kids excited for Christmas. Then remember, on Christmas Eve, leave cookies and milk out for Santa because he does have a big job to do and might get a little hungry!